This issue of CQQ offers so much inspiration, it’s difficult for me to even know where to start! Our cover designer is Elisabeth Baty. Her stumpwork cornucopia is absolutely stunning! 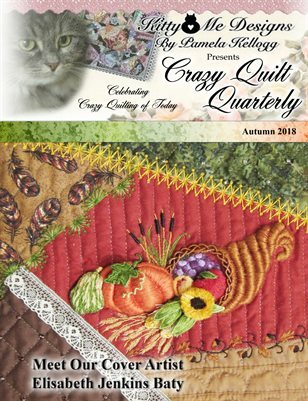 Also in this issue are projects by Betty Pillsbury, Gill Compigne-Leaney, Suzy Quaife, Jan Conwell, Angela Grasse, Janese Morris, Renee Watts, Darlene Kliewer, Brenda Sandusky, Robin Waybright, Genevieve Tracey, Mary Anne Richardson and a combined article by Alice McClelland & Janet Popish. As always, we’ve included some charted seam treatments and Kathy Shaw has designed some lovely Autumn embroidery patterns.